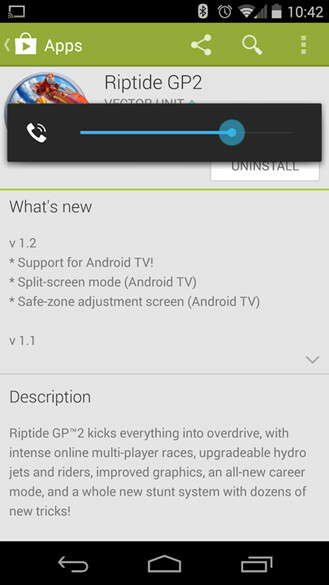 The developers of popular game, Riptide GP2, have pretty much confirmed that Android TV is well on its way, and will likely be announced later today, when Google gets going at its annual I/O event. This insight came in the form of an update to the game and changelog (since removed), which clearly listed that the game will have support for Google's still unofficial Android TV platform. In all honesty, we've been expecting as much, not to mention that the reports as of late have been more and more unanimous. This wouldn't be at all a surprising step for Google, which already has the existing Google TV set-top box along with the $35 Chromecast dongle. Where Android TV will reportedly differ is in its ability to provide a more in-depth user experience through a richer set of functionality, and will most likely also allow for gaming. Either way, it shouldn't be long until we know for sure. With Google I/O less than 10 hours away now, at the very worst we'll get word (or not) of Android TV by the end of the 26th (tomorrow), which is when the conference will be over. Finally Google's starting to take the TV space seriously... AirPlay KILLER ! Useless.. I still don't have google play movies! Can't wait for a 99 dollar box that can play games with a PS Controller! Finally something real for Android on the TV. Lets watch the "Lord of the Lags"
If it has Play store installed....than I'll download a Windows 8 launcher.